Hello to each of you and trust those that had a Spring break have returned to school revived! The 22nd issue of Dialogue Australasia journal and 2010 Membership Renewal Invoices will be sent to all financial members of DAN in early November 2009. If you haven't renewed your 2009 Membership, it's not too late! Contact the EO before Monday 19 Oct! One for the Diary for Term 1 2010: Teaching Stillness & Silence Seminars in all States, 22-26 March 2010. Further details will be confirmed in November 2009 and posted on the DAN website. CULTURE WATCH - How to stay one step ahead of your students and be across issues provoked by the latest movie, song or DVD release? In America, Up has become the second-highest-grossing Pixar film after Finding Nemo. The ambitions of the principal characters are uplifting and inspiring. This is what actor Ed Asner admires most about his character, Carl: ‘He dreams beautiful dreams, and he’s willing to fight the dogs of society to maintain them.’ The film not only shows us people realising their dreams, it also questions which dreams are worth fighting for'. The story of Carl’s life begs the question: what constitutes a life well spent? The film answers its own question: a life that looks up and out, that stretches beyond itself to help others. Read more about Up. PHILOSOTHON EXPANDS! An inaugral NSW Philosothon was held at Ascham College, Sydney on 10 September attracting some 14 schools. Read here for reflections on the event by Mr Michael Parker, Head of Senior School at Cranbook. Some 25+ schools will take part in the WA Philosothon on 28 October 2009, and other competitions are planned for Melbourne, Adelaide and Brisbane. Read more information about participating in a Philosothon. Congratulations to Head of Philosophy, Values & Religion at Hale School, Perth and Philosothon Organiser, Matthew Wills, who has been awarded a Vincent Fairfax Ethics in Leadership Foundation Churchill Fellowship. 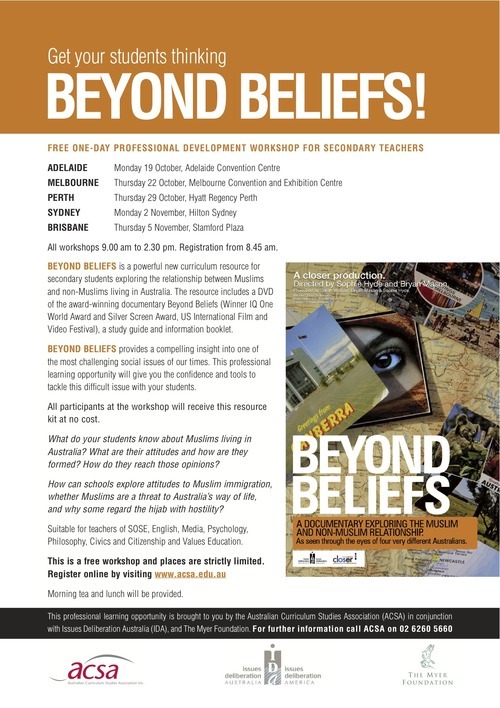 With a view to establishing a truly National Philosothon in Australia, Matthew will travel to the US at the end of the year to visit people and organisations involved in promoting and enriching the teaching of Philosophy and Ethics in secondary schools, with a particular focus on US regional and national “Ethics Bowls” (similiar to Philosothons). Read more news from Matthew. Short Cuts - to various bits and pieces that might be of interest! CHRISTOPHER HITCHENS, author of God is Not Great, was in Sydney recently for the Festival of Dangerous Ideas. WATCH him on ABC TV Q+A and ABC Unleashed and READ various perspectives on his radical atheism in eurekastreet.com.au. WATCH The Spiritual Quest - on Global Spirit. Featuring comparative religion scholar Karen Armstrong and Professor of Buddhist studies Dr. Robert Thurman, and drawing on personal experiences and the guests’ extensive knowledge of various religious traditions, this fascinating conversation illuminates the individual and universal dimensions of the Spiritual Quest. The episode asks questions that have intrigued humanity since the dawn of time such as: What is the meaning of life? What does it mean to take a spiritual journey, what would that journey look and feel like and what is the role of a teacher? * John Armstrong on What Can You Do With Philosophy? SEE The Director's Cut for the 2009 Blake Prize for Religious Art: check out the online gallery of works that seek to explore the religious and spiritual in art. READ Art for God's sake from ABC Encounter. Plans are afoot to relaunch the DAN Spirited Arts Prize in conjunction with the Blake Prize in 2010. Watch this space! Established in 1896, St Hilda's is one of Western Australia's leading independent schools. Students seek out challenges to enhance mind, body and spirit, while broadening their horizons in knowledge, skills and understanding. An employee at St Hilda’s is part of a dynamic culture in a nurturing community which fosters and encourages personal development. 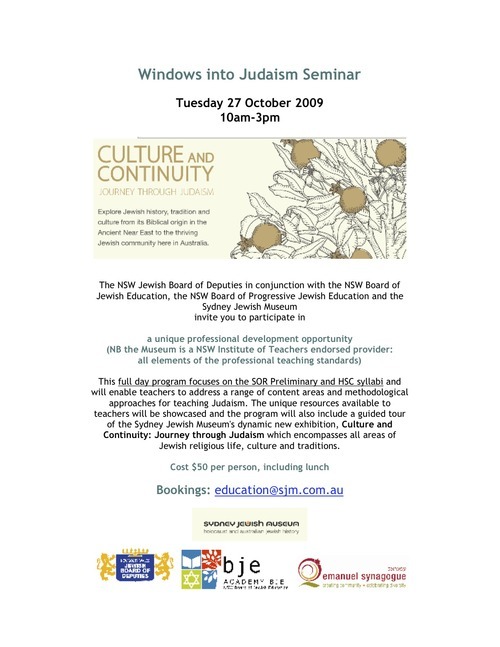 Applications are invited from dedicated and innovative educators to lead this vibrant department from January 2010. The successful applicant will be qualified in theology and philosophy. He/She will be keen to integrate the curriculum with the multiple opportunities for spiritual development offered in the school community. A Road to Mecca: The Journey of Muhammad Aasd - In the 1920s Austrian Leopold Weiss left his Jewish roots and converted to Islam and became one of the most important Muslims of the 20th century. He was an advisor to the king's court in Saudi Arabia and later translated the Qur'an. He became a co-founder of Pakistan and finally an ambassador to the United Nations. This one hour film explores the frontline between the Muslim world and the West by following Muhammed Asad's fading footsteps from Mecca to 'Ground Zero'. Buddhism and Abortion - In the West the abortion debate is polarised, but Buddhists in Asia hold both pro-life and pro-choice points of view at the same time. We find out about the ethics that support that complex position and a Japanese Buddhist ritual associated with abortion that has found its way to America. Seven Deadly Sins: Pride - 'Pride comes before the fall' is the ancient warning to all who are tempted to boast, but how much do we believe this in a culture that encourages self esteem and panders to celebrities? Australian music legend Jimmy Barnes reflects on Pride in the music industry, while author Rev'd Dr Steven Ogden, interfaith minister Stephanie Dowrick, and Senior Chaplain at RMIT, Dr Ruwan Palapathwala reflect on how we live with the 'P' word. Raymond Gaita on The Idea of Absolute Value - 2009 Joy Maclennan Oration. Is dignity an inalienable human characteristic, or is it merely tied to appearances, and as such external to our core humanity? How does an understanding of inherent value and dignity inform the way we care and empathise for each other? Would a more thorough respect for human value render us unable to torture? These are some of the big ideas addressed by philosopher Raimond Gaita in this challenging oration at the Adelaide Festival of Ideas. Wholly Text - The sacred scripture of Islam, the Qur'an—as revealed to Mohammed in the Arabic language—is regarded as untranslatably holy. But while the Christian Bible has been retold in myriad languages, each translation is believed to retain the power of the original as the Word of God. Ben Van Wyke explains the history of the Christian Bible and the concept behind its translation. 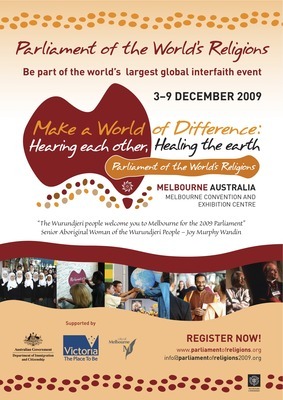 Why not think about Volunteering for the Parliament of World Religions?